"Highway Points Named, Morning Oregonian, April 1, 1915"
Click image to enlarge Tumalt Creek, Oregon. Image taken March 30, 2015. Oregon Historical Society and Mazamas Co-operate in Making Needed Changes. "Renaming of the points of interest along the Columbia Highway has been completed by a joint committee from the Oregon Historical Society, Oregon Geographic Board and Mazamas, at the request of the United Highway Commission, and the complete new list of names will be submitted to the United States Geographic Board for the final approval. Many points heretofore unnamed have been named and in certain cases the old names have been changed where it seemed appropriate. The most of the investigation for the renaming was conducted by F.X. Riddell, E.C. Sammons and George H. Himes. Beginning with Deadman Creek, just east of the Multnomah County line, the committee has changed the name to Ruckel Creek, in honor of J.S. Ruckel, one of the original owners of the portage road around the Cascades of the Columbia. The lower falls on Eagle Creek have been named Metlako Falls. Metlako was an Indian legendary goddess of the salmon. The mountain between Eagle and Tanner creeks about a mile east of Bonneville has been named Mount Wauna, from the legend of the Bridge of the Gods. This point is about 2500 feet in elevation. The falls in Tanner Creek have been named Wahclella Falls, for the Indian tribe that dwelt along the river near Bonneville and the Cascades. The mountain about 2000 feet high between Tanner and Moffett creeks just west of Bonneville has been named Mount Munra, in honor of "Grandma" Munra, who for years kept the railroad eating-house at Bonneville and who is one of Oregon's widely-known pioneer women. The name Mount Munra already is used locally around Bonneville. The falls on Moffett Creek have been named Wahe Falls, an Indian name of the locality. The mountain just west of Moffett Creek has been named Mount Wauneka, an Indian name of the locality. 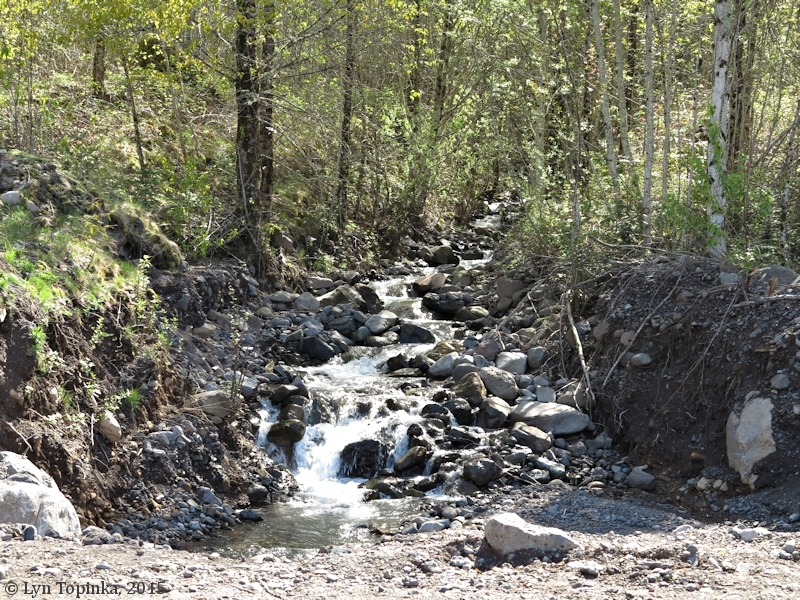 The stream east of Warrendale is named McCord Creek, in honor of W.R. McCord, a pioneer who built the first fish wheels near the mouth of the stream. The falls in McCord Creek have been named Elowah Falls. 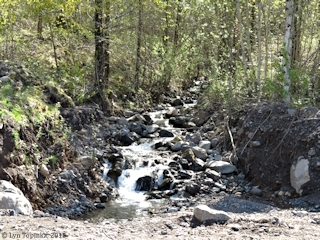 Devil's Slide Creek west of Warrendale, is instead named Tumalt Creek, in honor of old Tumalt, who camped at the mouth of the creek in 1856 and aided the Hamilton family to escape from the Cascades massacre. The committee recommends that the high mountain between Tumalt Creek and St. Peter's Dome be called Yeon Mountain, for the very obvious reason that Mr. Yeon has given so much time and money in the construction of the highway and should have his name attached to some prominent feature. The spire directly across Leveens Creek from St. Peter's Dome has been named Katant Rock, from an Indian word meaning "Place of rocks." The cliffs in the southeast corner of section 3, township 1 north, range 6 east, west of St. Peter's Dome, will be known as Mount Kiesano. Kiesano was the last chief of the Multnomah tribe. The high pinnacles between Oneonta Gorge and Multnomah Falls have been called Winema Pinnacles. Near the head of Tanner Creek is a point known as Shellrock Mountain and this committee recommends be changed to Mount Talapus, a legendary deity of the Indians represented by the coyote. There is another Shellrock Mountain along the Columbia River near Wyeth, widely known to all travelers, and the committee found that confusion existed. The committee has christened the highest point immediately adjacent to the Columbia River between Portland and The Dalles, Mount Nesmith, in honor of Oregon's pioneer Indian fighter and Senator, Colonel James. W. Nesmith, a pioneer of 1843. The point in question is south of Warrendale, clearly seen from the river, and is 3878 feet in elevation. Cub Peak, to the south of Mount Nesmith, will be changed to Palmer Peak in honor of General Joel Palmer, an Oregon pioneer of 1845. For Gordon Falls the committee selected the name Wahkeena Falls. This was done for the reason that there is another Gordon Creek about three miles away flowing into Sandy River, and a Gorton Creek at Wyeth. The name of the highway itself is not yet a settled matter. The State Highway Commission refers to it as the Columbia Highway, and the county officials as the Columbia River Highway. The committee was of the opinion that Columbia Highway would be better because it was a shorter name and because the public generally refers to it by that name. It is expected that the various officials will finally agree on a standard." Source: Morning Oregonian, April 1, 1915, courtesy Historic Oregon Newspapers Archives, University of Oregon Libraries, 2014.